These are lyrics by Alien Ant Farm that we think are kind of repetitive. The song's like 6 minutes, most of it's that over and over again. 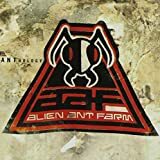 Alien Ant Farm's, "Smooth Criminal"
Annie are you okay? Would you tell us, if you're okay. Its a great song but, for real, could they say that a few more times maybe!